Arlen’s twin sister was stolen by the fey moments after her birth. 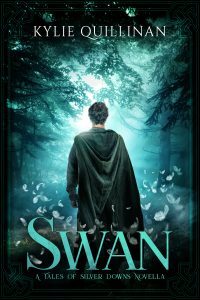 When he is sent to advise the king, his plan to search for his missing sister must be put on hold — until he realises that she might be the key to bringing peace to the kingdom. Agata doesn’t know she’s part mortal. Raised by the queen of the fey, she despises mortals just as much as Titania does. When Agata accidentally encounters the twin she was separated from at birth, she discovers that everything she thought she knew about herself is a lie. 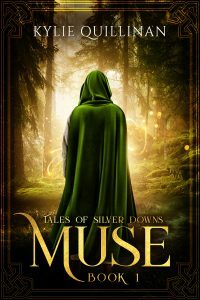 Arlen wants to rescue his sister and bring her home. Agata isn’t sure she wants to be rescued. 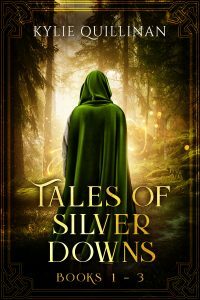 To restore peace to the kingdom and retrieve Agata from the fey, Arlen must forge an alliance with the Old Ones who have been in hiding for thousands of years. 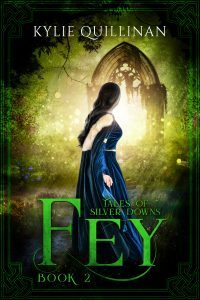 The balance between mortal and fey is finally broken and one race will be banished in an epic showdown between the children of Silver Downs and the fey. I sat cross-legged in front of a pond. Its depths were clear and calm, with just the slightest ripple. The woods around me rang with birdcalls and the rustle of leaves from various forest creatures. I stared into the pool and concentrated on letting go of all thought. As my mind became as calm as the water, my body also relaxed. The mossy ground was cool and slightly damp beneath my linen pants. A beetle crawled over my bare foot. I inhaled, filling my lungs with the scent of moist earth, cool water and rotting leaves. I watched the water and tried not to let anxiety crowd into my mind. Eventually, I would master control of the Sight. If I waited long enough and kept my mind still enough, the waters would show me something. A voice from behind me broke into the stillness I was concentrating so hard on. "Arlen, Oistin asks that you go to him." I sighed and pushed my irritation aside. It was not the boy's fault that I had managed to achieve the calmness I sought only moments before he spoke. "Did he want me urgently, Pilib?" My gaze never left the water, hoping I might yet See something. "He asked that you attend him immediately." I nodded and heard just the faintest rustle of leaves as the boy retreated back in the direction from which he came. I shouldn't have been able to hear him at all, but he was an apprentice just newly arrived. He had much to learn yet. With one last wistful glance into the pond, I climbed to my feet and brushed the dirt from the seat of my pants. As I set off through the woods, I wondered what Oistin wanted. Perhaps he intended to ask me to take a new boy under my wing. Perhaps he merely planned to ask after my studies. I pushed the thoughts from my mind. There was no point in speculating. I would find out soon enough. tree, or sitting on a flat rock, or just roaming the woods, reciting the lore we learned, practising calling the elements, or trying to master the Sight. The heavy wooden door of the lodge stood open. It was rarely closed. Inside was cold and dark, for evening approached and the lamps had not yet been lit. The aroma of vegetable soup and fresh bread made my mouth water and reminded me that I hadn't eaten today. I made my way through the corridors to Oistin's quarters. As the master druid, Oistin had chambers that, although modest, were far larger than the room I shared with three others. I rapped softly on the open door, waiting until he bade me enter. Oistin sat behind a large desk, examining a piece of parchment, which he held close to his face. "Arlen, come in." He placed the parchment on the desk and motioned to me with both hands. "You wished to see me?" "Yes, yes." For a moment, Oistin looked puzzled, as if he couldn't recall why he had summoned me, then he nodded. I suspected he wasn't as forgetful as he sometimes pretended. He ran our community with tight reins and rarely let an important detail slip. "Arlen, I have a task for you." "I am sending you to Braen Keep to be an advisor to Hearn. You will leave as soon as you pack your belongings." "Master?" My carefully cultivated calmness evaporated. "It's a new stage of your journey, boy. A new adventure. Great responsibility." "You're sending me to the king?" him with the country's best interests in mind." Oistin was looking anywhere but at me. At his desk, at the wall, at the rug-covered floor. "Master, I don't understand." How could he have forgotten? Oistin knew my greatest failing as a druid. He knew why I was the person least suitable to undertake such a task. "I know it might seem intimidating. You'll be surrounded by more people than you're accustomed to. It'll be noisier. You'll need to find a quiet place of your own where you can continue to practise your craft." "How will I advise the king?" I asked. "You know I have no ability with the Sight." Oistin sighed and finally looked directly at me. "You will do what you must do, Arlen. Now go gather your belongings so we can send you on your way. Tonight you will dine in the king's hall." "Does this mean my training is concluded?" He looked at me for a moment and I knew what he was thinking. He knew there was a personal task I planned to complete as soon as I had finished my training. A task that I had never kept secret from him and that I had no intention of postponing. 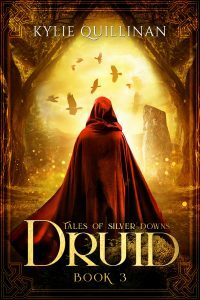 I would repay my training and serve as druid wherever he wanted to send me — once my task was complete. "Your training is halted for now," Oistin said. "You must continue to teach yourself what you can in the meantime. When Hearn no longer requires you, you will return here to finish your training." I left Oistin's chambers with my head held high and my shoulders straight. I breathed deeply — in, out, in — as I strode along the corridors to my own chamber. A sigh of relief when I arrived to find it empty of my fellow druids. Our accommodations were sparse: four narrow cots, each draped with a grey blanket, one cot against each wall. A well-worn rug on the wooden floor. That was all the chamber contained. Our belongings, such as they were, were stored in boxes beneath our cots. We were permitted two boxes each. Our chamber was in the middle of the lodge, so there were no windows. The stone walls were bare with the exception of a small shelf to hold a lamp, which I lit now with trembling hands. I sank down onto my cot and dropped my head into my hands. I had grievously offended Oistin. Why else would he punish me in such a way? To send me away, my training incomplete, was a clear indication I had failed. I had always expected to leave the community eventually. Other than those few druids who remained here to teach, most stayed only for the ten years of our training. They departed to perform the roles for which we had studied: advisor, confidante, teacher. They interpreted visions and signs, performed ceremonies, led festivities. Above all, they mediated the balance between human and fey, that neither side encroached on the other's territories. All except for me. fellows had mastered the practice, and even now I found the air elementals elusive. I had difficulty interpreting the signs, for it seemed to me that a sign could be read in several ways, depending on one's mood and motive. But the area in which I had most soundly failed was the Sight. No matter how many hours I practised, I never Saw even the slightest glimpse of a vision in the waters. How would I advise the king with no Sight?